With two Clusters of Excellence, 37 Collaborative Research Centres and Transregios, 27 Junior Research Groups and more than 40 Research Training Groups and PhD programs, the universities of Bochum, Dortmund and Duisburg-Essen offer excellent working conditions for early career researchers. The diverse doctoral programs enable a successful start to a research career through excellent supervision, professional and interdisciplinary qualification as well as close contact to other doctoral and postdoctoral researchers at University Alliance Ruhr (UA Ruhr). The three UA Ruhr universities provide an environment for top-level research and support in developing a personal profile at all career stages. Numerous Junior Research Groups and research awards reflect the excellent achievements of our postdoctoral researchers. Graduate Schools, Doctoral Programs etc. Doctoral college "Die Arbeit und ihre Subjekte"
Human Computer Interaction for demographic change: Junior Research Group "Personal Analytics – Technical and user-oriented methods for improving life-quality"
The Global Young Faculty is an initiative of Stiftung Mercator in cooperation with the University Alliance Ruhr and is coordinated by the Mercator Research Centre Ruhr in Essen. 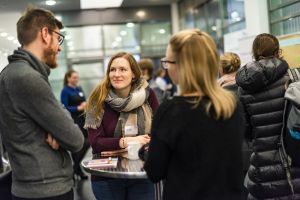 The program brings together outstanding and dedicated early career researchers researchers from universities and non-university research institutions based in the Ruhr area. It supports them in their efforts to forge new professional contacts and share ideas beyond institutional and disciplinary borders. As per: January 2019. This page will be updated regularely and is subject to errors and changes. Please inform us by e-mail if contents are outdated or missing.